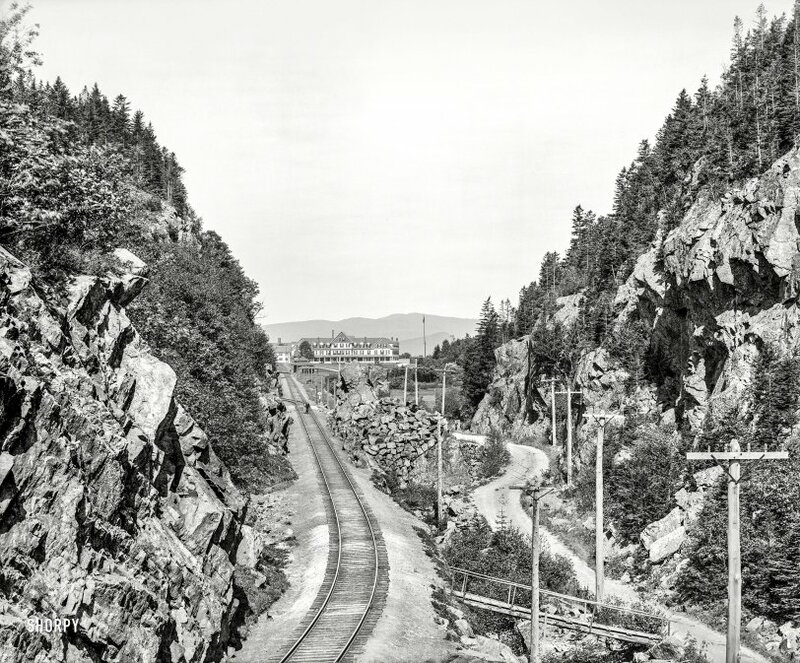 Crawford Notch, New Hampshire, 1907. "Gate of notch toward Crawford House, White Mountains." 8x10 inch dry plate glass negative. View full size. Submitted by Zoreo on Tue, 03/07/2017 - 8:58pm. It must have taken a lot of work to cut through those rocky hills. I can't imagine how they did things like without modern construction equipment. Submitted by BillyB on Mon, 03/06/2017 - 11:18am. The tracks appear to make a loop behind the hill to turn the train around for the return trip. It looks like a good walk from the depot to the hotel. Submitted by JamesG on Mon, 03/06/2017 - 10:30am. I saw the Crawford House before it burned during a trip to New England in the 70's. Shame it was allowed to deteriorate. The railroad station in the photo still survives. It has been converted to a restaurant. Submitted by bsulliva on Mon, 03/06/2017 - 7:43am. Submitted by ka1axy on Mon, 03/06/2017 - 7:11am. Now the site of the Appalachian Mountain Club's Highland Center. 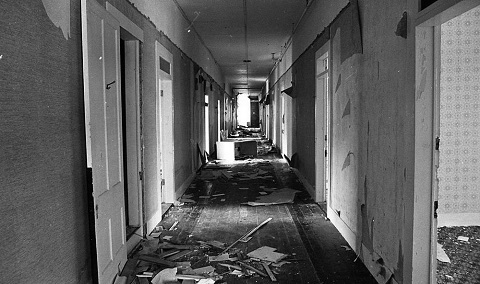 The "Omni" Mount Washington Hotel, just up Route 302 in Bretton Woods, is still active. It's worth a stay just to experience how life used to be in the White Mountains. Submitted by DeeGee on Sun, 03/05/2017 - 7:57pm. It won't be until 1977 that the inevitable fire destroys this wooden masterpiece. Full description of the fire can be found here. It had definitely seen better days right before the end.